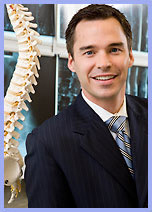 Welcome to the Center for Spine Care blog! We look forward to disseminating relevant, up to date information on modern treatments for back pain. John Peloza, M.D., Medical Director of the Center for Spine Care, is a pioneer in many modern technologies for the spine. Nathan Walters, M.D., CSC’s Pain Management physician, focuses on conservative treatments such as physical therapy, medications, and spinal injections to diagnose and treat pain. Dr. Peloza & his colleagues at CSC will share important, evidence-based medical information here.